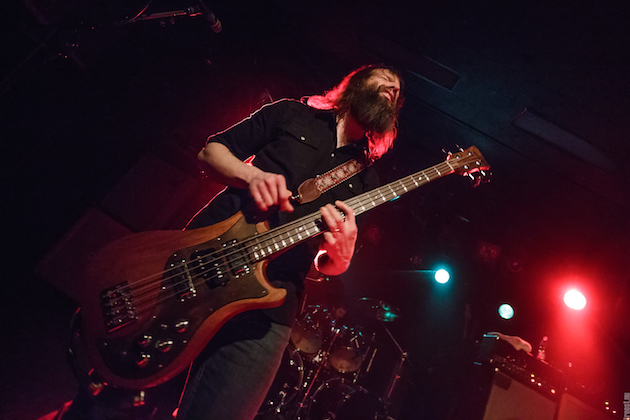 In the aftermath of an unprecedented snowstorm the night before, High on Fire’s scorching stoner metal was going to be a welcome blast of sweltering heat to alleviate the winter frost — at least if their most recent show here in Copenhagen is to be used as the benchmark. That performance was a huge success risen in equal parts from the enthusiasm of the audience and the fervour of the band, and as such, I am perplexed to discover that the small hall of VEGA is only bustling at half capacity tonight; not the ideal circumstances for a band whose live excellence is best felt with sweat dripping down the walls, torrents of spilled beer coursing through the floor, and a thick mist of swampy heat hanging in the air. 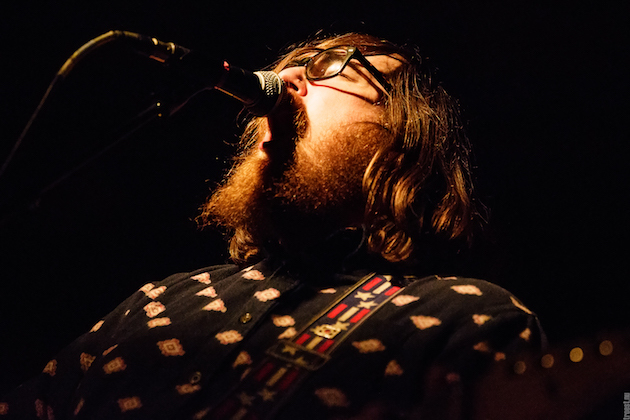 By the time Bask step onto the stage an hour after the doors have opened the crowd’ remains a rather sorry sight, with only a handful of patrons scattered across the floor to take in what is widely touted as the perfect mix of Band of Horses, Baroness, Red Fang and Led Zeppelin. And whether it is the poor turnout instilling it, the quartet has trouble winning anyone over with their reserved aura and songs that, while certainly justifying all of the aforementioned references, are perhaps inflicted by too many shifts in dynamics without delivering the necessary anchor points to afford the songs lasting value. From a musical perspective Bask are at their finest during the moody, bluesy, clean guitar passages housed in virtually every song, but it is when the sludge rains down that the four musicians — guitarist / vocalist Zebulon Camp, lead guitarist / backing vocalist Ray Worth, bassist Jesse Van Note, and drummer Scott Middleton — unfix their gazes from the shoes and throw themselves around in erratic jolts to provide something to look at as well. Still, there is almost no enthusiasm to be spied on any of the guys’ expressions, making them seem uninterested in planting that seed within us that would make us delve into their 2014 debut album “American Hollow” immediately after the concert. And when the songs themselves have such difficulty disclosing their merit, no measure of powerful singing by Camp nor endlessly inventive melodies by Worth has the quality needed to lift this performance to a properly convincing level. Fortunately the crowd has swollen considerably during the opening act, and when the Oakland, CA stoner metallers deem it time to get things started, the front half of the room at least is satisfactorily packed. 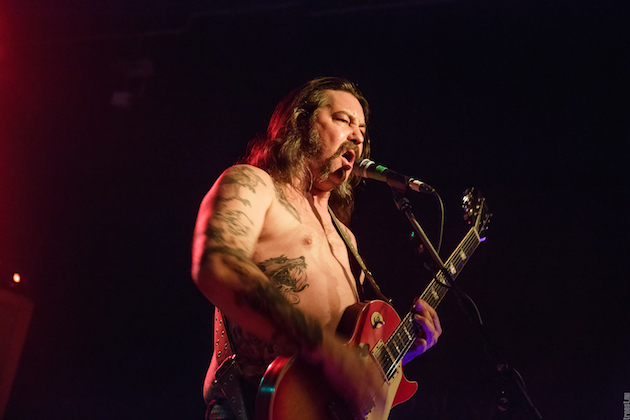 As is his way, guitarist / vocalist Matt Pike wastes no time to deliver pleasantries: he simply roars ”We’re High on Fire, and this is ‘The Black Pot’! after which he and his colleagues, drummer Des Kensel and bassist Jeff Matz, floor the pedal and proceed to plough their way through the first five songs with barely a pause to breathe. The tracks are interspersed only by Pike’s spitting out their titles, which ensures High on Fire’s set remains customarily intense throughout (helped along the way by the bass levels that rattle one’s guts ever so sweetly). But the affliction of another weekend drawing to a close seems to be preventing the same sort of reaction that was witnessed in the audience at the KB18 concert mentioned in the introduction to this review, and so that unhinged atmosphere every High on Fire fan longs for never really manifests itself. There is the odd crowd surfer, spreading his arms like wings to assert his approval of the magnificent “Falconist”, as well as loud cheering and applause in between the songs of course. But overall, there is a strong sense of Sunday fatigue pressing the mood that even fan favourites like “Cometh Down Hessian” or “Slave the Hive” cannot redeem. Fortunately, Pike, Matz & Kensel are not only competent musicians, but also possess an uncanny ability to jam their way into people’s hearts with searing riffs, pummelling drums and psychedelic solos, and as a result, you can tell from the widespread smiling that even if the energy is not quite there, no one in here seriously doubts High on Fire’s live abilities. 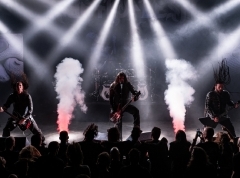 The band members themselves are not renowned for their explosiveness, but what these middle aged men lack in stage antics they fully compensate for with an almost maniacal style of play and an attitude brimming with bad-assery. As the imposing “Snakes for the Divine” closes the proceedings then, it is not with a sense of disappointment that I walk home — rather, it is general approval mixed with the knowledge that High on Fire fare better with a charged audience up close and personal. Certainly the fat that so much of tonight’s setlist is taken from the band's latest album "Luminiferous” plays a part too, with many of the usual turbocharged staples like “Devilution”, “Fury Whip” and “Baghdad” replaced by slower and more atmospheric pieces like “The Sunless Years” and the already mentioned “Falconist”. Those are accomplished tracks in their own right and of course High on Fire would want to showcase their latest work as extensively as possible. But I am sure I am not alone in longing for a little more ferocity from these proceedings — either in the form of moshing or with more savage picks on the setlist.